Do you have a sweet tooth? I think I have more than one! These sugar-free cheesecake squares are perfect when you’re craving something sweet. These bite-sized treats pack a lot of flavor. Save some for yourself to snack on or serve on a platter to share with your favorite people. Place softened butter and sugar-free sweetener in a mixing bowl and beat until smooth. Add chopped pecans and stir until well blended. Press into the bottom of a greased 9-inch square pan. This almond flour crust is just as delicious as the filling. It reminds me of my favorite cookies as a child, pecan shortbread cookies! I love this crust and I can imagine it being a good pie crust for other dessert pies as well. Use a super fine ground almond flour, like Bob’s Red Mill, for best results. Put the softened cream cheese, sugar-free sweetener, egg, and almond milk in a mixing bowl and beat for 3 minutes. Spread on top of the cooled crust. Swirl the sugar-free strawberry preserves on top. Bake at 350 for about 20 minutes. Chill before serving. Experiment with different flavors of sugar-free preserves! Blackberry, raspberry, blueberry, etc. Be sure to check the nutritional information. 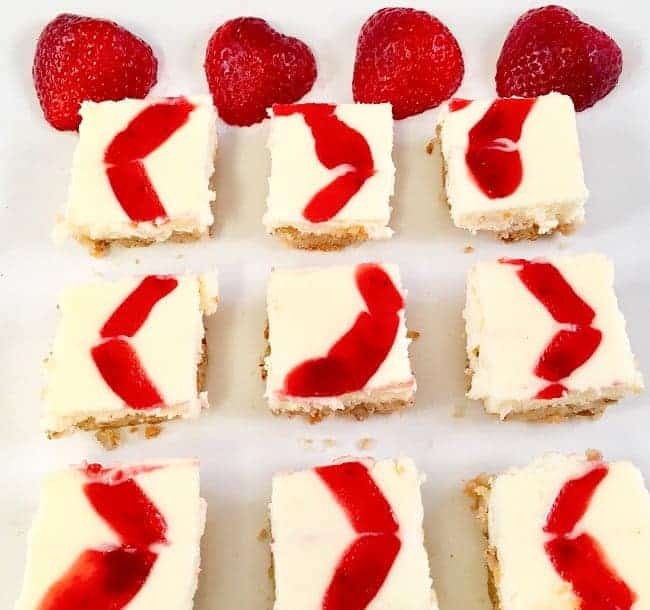 These low carb strawberry cheesecake bites can easily be made into a keto dessert. Just use a natural, sugar-free sweetener such as stevia (I prefer liquid stevia glycerite because it’s less bitter). But of course, use YOUR favorite! Everybody has a preference, right! Also, for keto, depending on which keto plan you’re following (I understand there are 3 types of keto! ), you could skip the sugar-free strawberry preserves used in this recipe, and just have a strawberry on top or skip altogether. For more information about keto sweeteners and other foods, here’s a very good list of what to eat, and what not to eat on the ketogenic diet https://www.dietdoctor.com/low-carb/keto/foods. Preheat oven to 350F. Grease a 9-inch square pan. Place softened butter and sugar free sweetener in mixing bowl and beat until smooth. Add chopped pecans and stir until well blended. Press into the bottom of the pan. Bake 15 minutes or until lightly browned. Remove from oven and let cool or 10 minutes. While the crust is cooling, add the softened cream cheese, sugar free sweetener, egg, and almond milk to a bowl. Beat for 3 minutes until creamy and smooth. Spread on top of the crust. Heat the strawberry preserves in the microwave for about 20-30 seconds or until smooth enough to pour. Drizzle the melted strawberry preserves on top of the cheesecake, making 4 horizontal lines. Then, run a butter knife through the horizontal lines to create a swirl effect. It doesn't have to be perfect! Swirl the preserves any way you want. Bake about 20 minutes or until the filling is set. Cool completely before slicing and serving. I like to refrigerate this for a couple of hours before slicing and eating. This low carb strawberry cheesecake recipe makes about 32 squares. Each square contains approximately 2.06 net carbs, depending on the sugar-free sweetener and brands used. I happen to like granular Splenda and that’s what I used to calculate the net carbs for this recipe (see Notes below). 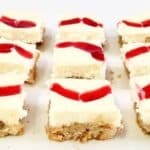 I hope you enjoy these low carb strawberry cheesecake squares. If you try this recipe, let me know what you think. I’d love to hear from you. Let’s keep in touch. Now the legal stuff (because my mama didn’t raise no fool): Please note that I am not a medical or nutritional professional. I am simply sharing my personal favorite recipes on this blog. Please consult with your physician before starting any diet or exercise program. I provide net carb information for my low carb recipes simply as a courtesy to my readers. I expressly disclaim any and all liability of any kind with respect to any act or omission wholly or in part in reliance on anything contained in this website. Wow this looks amazing guys! My fave dessert; cheesecake with strawberries. Perfect combo of sweet and tart, if you ask me, because it never feels heavy but still fills you up. I love it. Thanks for sharing guys. I went to the store yesterday to buy ingredients for this recipe and now I don’t see the recipe anymore! Come back, recipe! Hi Eva! My deepest apology to you. We are in the process of changing themes and sites. I’m so sorry you experienced this huge inconvenience. The recipe card should be showing up now. Thank you so very much for alerting us of this problem! !